"I have run a murder mystery birthday party every year for my birthday from Freeform Games for the past 4 years. All of my friends love them and year after year when it comes to fall, and then to December (when my birthday is) they ask me every day if I have chosen the theme yet. Everyone really gets into it and tons of lies are spread. It is great because it really plunges everyone in to interact with one-another - no icebreaker needed! Alliances and secret meetings and evesdropping are some of my favorite parts. Thanks, freeformgames.com for making the best parties ever!" "I purchased Snow Business to play over Christmas / New Year period. A group of us (18 in total) rented a chalet in Morzine and we played it there. I actually only got back yesterday. The game was brilliant, it went down really well, everybody enjoyed it... So thank you Mo and Steve it was excellent." "I just wanted you to know Snow Business was a huge success! Everyone involved had a wonderful time! I have now done two of your murder mysteries and plan on working my way through all of them! I have already had several folks ask for another one. Overall my guests and my family had a blast and we will be doing it again soon!" "Snow Business was our second game from Freeform Games – our son just LOVES them – and we will do it again, definitely!! We didn't have much time to prepare because our son hadn't completely decided on whether or not to do a game this year.Even with our hurried time-frame, it was very easy to pull together! The last game we did was Casino Fatale. We loved them both. Snow Business was on a much smaller scale and we had a lot more time to talk to the players, eat and generally have a great time. GREAT FUN!!" "I chose Snow Business because it was appropriate for the number of players, age appropriate, and because we were all gathered for a winter vacation. The setting was perfect! It was so much fun! Even though one of my characters had to be gender-swapped, careful planning on my part ensured the appropriate amount of scandal that surprised many people at the end of the story!" "I can't remember the last time I've had so much fun or laughed so hard." Snow Business is a dinner party murder mystery game for 10 to 12 guests and a host – download the free introductory pdf file. In Snow Business, the stage is set for an innocent family gathering, with a few friends and strangers added to make the party go with a swing. However, not everyone is as they seem - some have dark secrets they need to keep hidden... and someone is the killer. You will be in the middle of the action and it will be up to you to wheel and deal with the other guests. Can you achieve your goals, keep your secrets hidden and survive Snow Business? It's up to you. Each winter, the Harrisons and the Perrys ski in the French Alps and always rent the Chalet Flaubert. They hire the whole chalet and bring both families and friends. The holidays are usually an opportunity to relax and unwind away from the pressures of normal life, but this year has been different. Jacqui and Mariella have been arguing, Lucy has sprained her wrist, snow has cut the chalet off - and tonight, real tragedy has struck. A few minutes ago, John Morgan was found dead at the foot of the attic steps, his neck broken at an unfortunate angle. Nobody can leave the chalet; and there is no phone or radio in here... Did John fall or was he pushed? Is there a murderer in Chalet Flaubert? Can you achieve your goals, keep your secrets hidden and survive Snow Business? It's up to you. What happened to the missing wallet? Who still carries a torch for an old flame? Is an ungrateful child really sharper than a serpent's tooth? What are the Swiss good at, apart from chocolate and cuckoo clocks? ... and, of course, who killed John Morgan? Find out in Snow Business! Snow Business lasts for about four hours and is suited to an evening. It is often played over a meal – a finger buffet if possible to allow guests to circulate and talk in private. "I love your games! They are easy to set up and do. I have tried other ones and they are inferior in my opinion. All of my Snow Business players had a wonderful time. I have already had several ask me when we are doing another one!" Alex Harvey – Jacqui and Mariella's cousin, and Mariella's best friend. Amy Morgan – Harold's sister and author of several children's books. Daniel Perry – Celebrated musician and married to Jacqueline. Harold Harrison – An accountant who also does the accounts for Bank Farm Stables. Jacqueline Perry – Mariella's younger sister and business partner at Bank Farm Stables. Jo Robertson – A skier stranded at the chalet. Jonathon Perry – Daniel and Jacqueline's son and is studying medicine at university. Lucy Harrison – Harold and Mariella's 18-year-old daughter. Mariella Harrison – Expert horsewoman and runs the Bank Farm Stables riding school with Jacqueline. Max Parker – A skier stranded at the chalet. Robin Fay – Celebrated orchestral conductor and a family friend. Travis Perry – Daniel's brother and a lawyer. 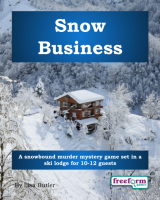 Snow Business is unlike many murder mystery games. Although the game starts with a death, most of the characters have more important things to do than to investigate it. And the killing is not over – it is certain that not everyone will survive the remainder of the evening! Snow Business is played just like a murder mystery game. You may be trying to solve the murder, but primarily you are (initially at least) concentrating on your own goals and objectives. Unlike most boxed murder mystery games, Snow Business lets you decide how to achieve your goals and thwart your enemies. On the evening of the game the guests are met by the organizer, the Chalet Host, and welcomed to the chalet. They then receive their detailed backgrounds - including dark secrets, goals and items. The fun then begins as they form alliances, blackmail each other, steal items and maybe even resort to murder! Depending on what the players choose to do, there are several different possible endings, but finally everyone finds out how they did, and what secrets everyone else was concealing. Snow Business costs £20.00 (GB pounds) or US $29.99. You can buy it in either currency, from anywhere in the world, as you prefer. The price will be converted back into your own currency for you, at today's exchange rate. We offer a Cast Iron Guarantee on all our murder mystery games. If you're not completely satisfied with Snow Business then please let us know within 30 days and we will refund you. See our full terms and conditions here.